Logitech certainly isn’t the cheapest when it comes to peripherals, but most of their products seem to fall neatly into performance or endurance categories. 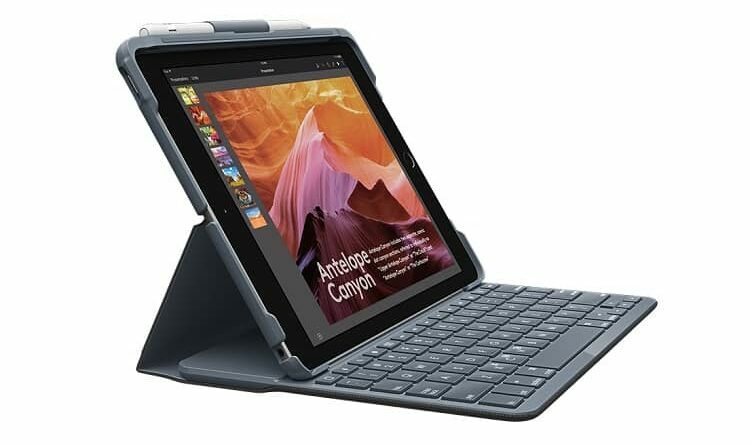 Their latest product is the RM449 Logitech SLIM FOLIO, an integrated Bluetooth keyboard and case for the 9.7-inch iPad 2018. The keyboard offers well-spaced keys and a comfortable and familiar layout. However, due to the form factor it comes in, there might be a bit of a learning curve in usage, according to Richard Sim, Logitech Country Manager for Malaysia. Unfortunately, this left us a little confused, since the two points Logitech is trying to make seem slightly conflicting; keys which are large, well-spaced and stretched from edge-to-edge – yet also come with a learning curve due to its smaller size. Irrespective of that however, the keyboard has managed to pack in a full row of iOS shortcut keys allowing users to switch between apps, bring up the search function, go to the home screen, and control the volume, directly from the keyboard. The typing angle of the Logitech SLIM FOLIO has been optimized to provide the most comfortable screen angle when typing on the desk, or viewing content on your lap. The Logitech SLIM FOLIO locks your iPad in the perfect position and stays firmly in place, even when typing on uneven surfaces. The folio is slim and light, but is built to withstand years of everyday use and protects your iPad from scratches, bumps and spills. The Logitech SLIM FOLIO uses Bluetooth LE to connect to your iPad, and automatically self-activates every time you put your tablet into the typing position. And, thanks to a smart power management system, the Logitech SLIM FOLIO is ready whenever you need it. The replaceable coin cell batteries last up to four years. “With four years of battery life, a lightweight design, and overall great typing experience, the Logitech SLIM FOLIO can help take your mobile computing to a new level, allowing you to enjoy laptop-like typing anywhere,” said Sim. The outer technical fabric, which was originally developed for the luggage industry, offers exceptional wear and is resistant to spills, but still soft to the touch. The fabric is nicely textured so it’s easy to grip, and it feels and looks great too. The Logitech SLIM FOLIO is available in Malaysia from Wednesday, 19th September onwards at all Apple Premium Resellers at the suggested retail price of RM449.00.